The Russian Defense Ministry has additional compelling evidence in support of the materials presented earlier on Sunday at the briefing devoted to the downing of Russia's Il-20 aircraft in Syria, the ministry's spokesman, Maj. Gen. Igor Konashenkov said. "I would like to address those, who would attempt to misrepresent or refute the presented information. The Russian Defense Ministry also has other compelling data about the September 17 tragedy, proving the materials presented at the briefing," Konashenkov stressed. The Russian Defense Ministry's spokesman added that the Russian side also used the materials provided by the Israeli side in the briefing's preparation. 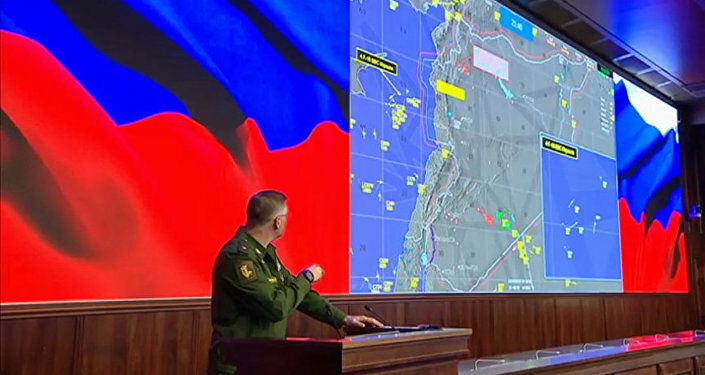 "The per-minute chronology of the Il-20 catastrophe and the actions of the Israeli aviation on September 17 presented at the briefing are based on the data of objective airspace control from various radars in Syria," Konashenkov stated. Following the Russian Defense Ministry's briefing the Israeli Defense Force said in a statement that an IDF delegation led by the Commander of the Israeli Air Force, Maj. Gen. Amikam Norkin, presented the complete IDF After Action Review (AAR) of the downing of the Russian Il-20 plane by Syrian anti-air fire to senior Russian military officers. "The result of the downing of the Russian plane by Syrian fire is severe and tragic and we convey our condolences to the bereaved families and the Russian people. The coordination between the IDF and the Russian military has proven its value numerous times over the last years," the IDF statement released on Sunday said. The Israeli Army continued to insist non-involvement in the Il-20 downing, claiming that the country's military delegation has provided Russia exhaustive and accurate details on the incident. ​​Responding to the Russian Defense Ministry's statement, the IDF said that the IAF (Israeli Air Force) F-16 jets "did not hide behind any aircraft", adding that the Israeli warplanes were in Israeli airspace at the time of the downing of the Russian Il-20 military plane. The result of the downing of the Russian plane by Syrian fire is severe and tragic and we convey our condolences to the bereaved families and the Russian People. The coordination between the IDF and the Russian military has proven its value numerous times over the last years. ​According to the Israeli Army's statement, "the safety and well-being of the Russian troops who operate in Syria are a focal component in every approval of any activity by senior officials in the IDF and in Israel." The IDF will continue to take all necessary measures, as it has been doing until this very day, to achieve this goal, the Israeli military assured. At the same time, the Israeli military will proceed with its operations aimed at countering Iran's military presence in Syria and the Islamic republic's attempts to deliver arms to Lebanon's Hezbollah movement, the Israel Defense Forces (IDF) stated. The IDF will continue to operate in accordance with the directives of the Israeli Government against Iran’s incessant attempts to establish itself in Syria and to arm the terrorist organization Hezbollah with lethal and accurate weapons. ​​The Russian Il-20 military aircraft, which was 22 miles off the Syrian coast, was shot down on September 17, while returning to the Hmeimim airbase. At the same time, four Israeli F-16 aircraft were bombing Syrian targets in the province of Latakia. According to the Russian Defense Ministry, Israel notified Russia of the airstrikes only a minute before their start and provided misleading information concerning the area of the attack and the location of Israeli F-16 jets. The ministry said that the Israeli pilots used the Russian aircraft as a shield against Syrian air defense systems. As a result, the Il-20 military plane was downed by a missile launched by Syria's S-200 air defense system at 10:03 p.m. local time (19:03 GMT). The incident claimed the lives of 15 Russian servicemen.